Online entries close on Thursday 3rd January 2018 at 5:00pm Australian Eastern Daylight Time (EDT). On the day registration will be available for a higher entry fee of $95. What do I receive for my $70 entry fee? Your entry fee covers the cost of the event. Fundraising helps to support people living with MS.
Where can I collect my Rider Pack? MS National Gran Fondo Championship participants will be able to collect their Rider Pack in Ballarat from 2pm to 6pm on Friday, 4th January at the Criterium Registration Marquee on Dawson Street South. Or at The MS National Gran Fondo Registration Marquee on Forest Street from 6am on Saturday, 5th January. What should I do if I can no longer take part in the event? Call us on 1300 733 690 or email events@ms.org.au to let us know so we can update our records. Unfortunately, entry fees are not refundable or transferable if you are no longer able to participate in the MS National Gran Fondo Championships. In exceptional circumstances we can transfer registration fees to another person. If you would like to request to transfer your registration fee, please email us. The minimum age to be able to participate in the ride is 16 years old (as of 1st January 2019). Safety remains our number one priority, and due to the number of riders and difficulty of the course, we have set the minimum age as 16. Riders between the ages of 16 and 18 can only participate in the recreational ride, as you must be 18 years or older (as of 1st January 2019) to be eligible for the Championship. What experience/level of fitness do I require? 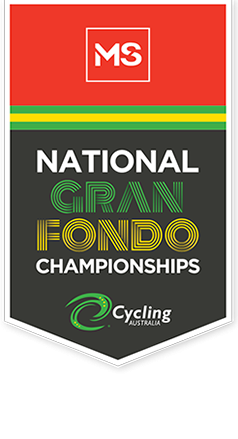 Anyone with a moderate level of fitness can take part in the MS National Gran Fondo Championships. We suggest that you undertake some training to make the event more enjoyable and to ensure you reach the finish line with a smile on your face! You will be riding on the same course that the elite riders will be tackling later on in the day. You will start under the same arch, have the same closed road conditions and climb the famous Mt Buninyong climb to the top of the King of the Mountain. Each lap of the course is 11.6kms. Are there any rest stops throughout the course? There will be 1 Rest Site along the course. This will have first aid, water, toilets, bike mechanics and information. What happens if I break down or I can’t complete the ride? Up to 40 volunteers and will be working along the route, as well as bike mechanics and first aid personnel. They are ready and happy to provide assistance to anyone who may breakdown, feel ill or experience other difficulties. We recommend that you have your bike serviced before the ride and carry a puncture repair kit and pump. If you breakdown, turn your bike upside down and wait. Is the ride on shared roads? The MS National Gran Fondo Championships is a closed road course. The course is coned off and only cyclists are permitted. How safe is the ride? Safety of riders is our top priority. We collaborate with VIC Police, the Transport Management Centre, a traffic management company & Ambulance Victoria to ensure your safety. If you follow road safety rules, drink plenty of fluids and follow marshal and traffic management instructions and signage, you'll have a safe and enjoyable ride. In the unlikely event of rain we know, cyclists are built tough – so the event goes ahead rain or shine! The ride will go ahead in line with our risk and safety management planning systems. In the case of extreme weather we will be make a decision prior to the event in conjunction with the CFA and Victoria Police. Cycling Australia work closely with the CFA and Victoria Police to ensure this is a safe event. In the case of extreme weather we will be make a decision prior to the event in conjunction with the CFA and Victoria Police. What sort of bike can I ride? Riders can choose from a selection of bikes to ride in the event, including road bikes, mountain bikes, city bikes, hybrid bikes, and cross bikes. We highly recommend Road Bikes as the course is classed as moderate to hard. The ride will start at De Souza Park, Warrenheip Street, Buninyong, Ballarat. Driving - Ballarat is a 75 mins drive from Melbourne. Take the 110km journey along the Western Freeway. Train - V-Line Trains run direct from Melbourne’s Southern Cross station, swipe your Myki to arrive in less than 90 minutes on the direct V/Line train at the 19th century-built Railway station right in the centre of town. Airport - The road trip from Tullamarine or Avalon airports to Ballarat takes about one hour. Options to get you here direct from the airport include hiring a car, or booking the Airport Shuttlebus which departs from Tullamarine. The site will be equipped with everything you’ll need on the morning including coffee, first aid, toilets, luggage service and bike mechanics (for those last-minute adjustments). What time does the event starts? The ride starts at 6:45am. There will be separate waves for each age groups which will then be followed by a separate recreational ride wave. I have items with me I don’t want to ride with. Is there a cloakroom service? Unfortunately not. We suggest taking only what you need to ride the MS National Gran Fondo. What is the best way to get to the event site? Is there any parking available at the course? There is ample parking at FedUni and well as on-street parking up around the start finish line, and at the local IGA. Road closure will be in effect, so please manoeuvre around these with care. You can visit the shop in the navigation bar or simply click here. I am following up on an order. Who do I contact? The winners of each age category will be awarded based on who completes 5 laps in the fastest time. If all riders in an age category do not complete 5 laps before the prescribed time a count back to who completed 4 laps first will decide the winners of each category. When you receive your timing chip from registration on the day of the event you will also receive the age category seat post sticker that you qualify for. Due to the nature of the MS National Fondo, there are rider cut-off times to ensure that the course is clear for the start of the next scheduled event. The Course is open for riders for 2 hours, and all riders must start their final lap by 8:20am. This is to make sure that participants are able to complete their final lap prior to 8.45am and have the ability to finish under the finish arch. Any riders who are aren’t able to complete their final lap by 8:45am will be asked to leave the course at the 300m to go mark and will not receive a final lap time.